During fourteen years in commercial film business, Lester James Peries has made six films. Not a very impressive record at least, as far as statistics go. but he is different from most other filmmakers. His first concern is quality. so naturally, the quantity is less. 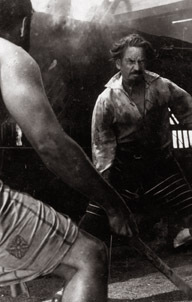 Between his first film Reekava (released in December 1956 and the second, Sandesaya there was a gap of four years. The third, Gamperaliya came after a lapse of three years after the second. The pace picked up two years ago (1966). Now he makes a film each year. 1966 saw Delovak Atara followed by Ran Salu in 1967. Just now his latest production Golu Hadawatha is ready for release. Golu Hadawatha is the second Sinhala novel to be translated on celluloid by Lester. 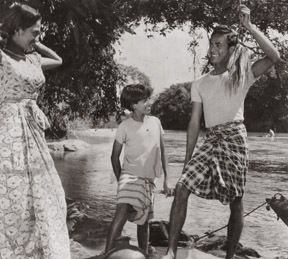 The first, Martin Wickramasinghe's Gamperaliya was not only a landmark in the development of Sinhala cinema but also put Ceylon on the map in the sphere of international cinema by winning the top award - the Golden Peacock - at the Third International Film Festival held in Delhi three years ago (1965) where it competed with films made by major film producing nations. The citation of the International Jury in making the award for the best human document reads: "Gamperaliya is judged the best feature film at this Festival for the poetry and sensitivity with which it explores and illuminates personal relations." Golu Hadawatha is based on the novel by popular writer Karunasena Jayalath. The novel won the Sahitya Mandalaya Award for Fiction a couple of years ago and has been a best seller ever since. 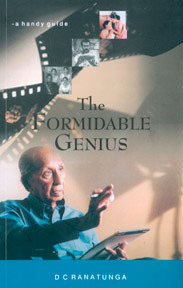 Reggie Siriwardena did the screenplay in both films. Lester and Reggie found a great similarity in both novels. The central experience - the personal relationship - in both stories is very true to life. And situations in both stories are essentially local. In Gamperaliya, Nanda had a conflict within her as a result of the affection she had for two men - one whom she knew loved her and the other whom she married. The identical conflict is seen in the other story where Damayanthi is fond of her school-mate while at the same time she had developed a liking towards the man whom she knew she had to marry someday due to a family arrangement. 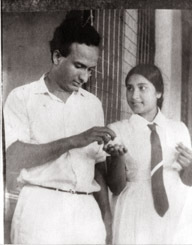 Both Nanda and Damayanthi had a common problem - a choice between two men. There was a difference, however. In the case of Nanda in Gamperaliya, the story could be told directly because she spoke of her conflict openly. As for Damayanthi it was the case of the heart which would not speak. From the structural point of view, Gamperaliya was clearly divided. There was the past, present and the future. In Golu Hadawatha, it was different. One story is repeated twice. It is the same story which is retold, once by the boy and later by the girl. Golu Hadawatha is the story of teenage romance. Sugath develops a liking towards one of his classmates, Dammi who is also fond of him. But she is to be married to her cousin according to a mutual arrangement between the two families. However, she is reluctant to tell that to the boy, who feels thoroughly let down when one day she announces that she only liked him as a brother. Here the girl's version is a hidden story and Lester was up against the problem of how her story could be told to the audience. The only way, he realised, was to have a dual version one giving the boy's point of view and the other, the girl's. Then there was the technical problem. Most of the incidents had to be repeated and they could not be changed in any way. Lester knew that repetition of identical scenes would tend to bore the audience. The incidents also had to bring out the two different points of view. He thought of recording one version in slow motion but later changed his mind. With cameraman M.S. Anandan, he then worked trying to utilise the capacity of the camera to represent different points of view. Say for instance, at the last meeting of the lovers on the beach when the story is told from the boy's angle, her face is not shown. Only her voice is heard. The sea is calm. The same sequence is shown where the story is retold from her side. Her face is shown against the backdrop of a rough sea. Golu Hadawatha will th us be a new experience for the Sinhala filmgoer who will see the same story being told in two different ways. Lester insists that this was not done merely because it is interesting but because the story did not permit any other way of recording it. Lester introduces a new duo - Anula Karunatilleka and Wickrema Bogoda - to the screen in Golu Hadawatha. Both of them were picked by Lester for bit roles in Gamperaliya. In Lester's last production, Ran Salu, Anula played keyrole. Lester had felt that this pair would be ideal for the two characters portrayed in the novel and signed them on without any hesitation. He has no regrets and is full of praise for their performances. They, in fact, dominate right through. The bulk of the shooting had to be in a school and with the permission of the Education Department, the film was shot at Dharmapala Vidyalaya, Pannipitiya. Like Gamperaliya, Golu Hadawatha too is a film without songs. Music does play a vital role though. Talented musician Premasiri Khemadasa had introduced two theme compositions which are repeated throughout the film to fit into the changing moods. Golu Hadawatha has been produced by Ceylon Studios and is their first production after many years. It's in a way an 'alien' production for them - a film without the usual gimmicks - songs, dances, fights and the like. Will the film click? That is their big worry. Well, the answer is with the filmgoers, who, we should not forget, are an intelligent lot.